For roughly fifteen years Paul Gayten was a vital presence on the national rock scene as a recording artist, a pianist behind others, bandleader in the studio and on the stage, a talent scout who discovered a wide array of notable names, a songwriter who penned numerous hits, as well as an A&R man and producer for significant labels such as Chess. 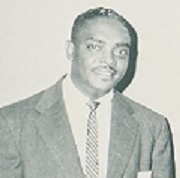 He was also the one who opened up New Orleans as a fertile breeding ground for rock ‘n’ roll by scoring out of the box with two national hits, one for himself the other backing vocalist Annie Laurie (neither a rock hit however, though Gayten’s B-side was a direct ancestor), in the summer of 1947 which led DeLuxe Records to make the city the source of much of its music roster, in the process launching rock ‘n’ roll itself when Roy Brown paid immediate dividends on that investment. Over the next decade and a half if the name Paul Gayten was associated with a record you were almost assured of hearing something that had equal parts effort and skill go into its creation, a fount of strong ideas and solid execution. The sheer reliability of those efforts alone made him a valuable presence in rock, a music that saw more than its fair share of artists rise fast and sink faster, blessed with a moment’s inspiration and cursed with a subsequent lifetime of stagnation. By contrast Gayten never sat still. He assembled New Orleans first great band, saw its members get poached by others, then set about recruiting and grooming another band just as good. Though he began by recording in the pop styles of the pre-rock era, he nevertheless foreshadowed rock’s rise with some of his work even before Brown had stepped foot in a studio, then after rock emerged he helped to define it going forward, in the process working seamlessly with male and female singers, ballad crooners and uptempo shouters, vocal groups alongside instrumentals. Along the way he provided encouragement and support to a wide array of artists, some who never made it past the local scene for lack of talent, others who became the biggest stars in rock. Despite all this throughout that fifteen years Gayten remained largely in the shadows, appreciated by those who stood to benefit from his work over multiple roles, respected by those who heard his music and understood the vital nature of his contributions, and yet mostly ignored by those in the public who knew only the bigger names adorning the records associated with him. But fifteen years is a long time to be at the top of one’s profession, especially one that underwent such drastic evolutionary changes in that time as rock had. Fifteen years is almost twice as long as The Beatles were international stars, three times longer than Otis Redding was on the scene, five times longer than Buffalo Springfield and N.W.A were cutting records together. Paul Gayten spent fifteen years making music that revolutionized the world… and spent the rest of his life receiving almost no credit or glory whatsoever for any of it. One of the intriguing – or frustrating – things about reviewing music from seven decades ago, especially this period just as rock is emerging but still without a concerted game-plan, is wondering just what its artists were thinking as they made it. They almost certainly weren’t thinking of the bigger picture that was transforming the music landscape, as we are now, but to think they weren’t aware of it would be giving them far too little credit. This is especially true of someone like Gayten, an all-around musician already with a reputation around New Orleans that placed him at the top of the local pecking order for bands in the city. There really can be no debating that rock music itself grew out of this specific environment in this specific era, one look at the artists (Roy Brown, Smiley Lewis, Dave Bartholomew, Annie Laurie and Gayten) who came out of this place and time who then went on to long and widely acclaimed careers in rock music over the next decade plus, confirms this. So of course they knew what they were doing, even if they didn’t know at the time where it would all lead. They were merely tapping into the sounds that were springing up around them in the Crescent City and one built upon the next and they all combined to give the movement some momentum. Gayten’s In The Evening When The Sun Goes Down is emblematic of that. Despite what the writing credits DeLuxe gave it, this was NOT a Paul Gayten original. It was written and recorded a dozen years earlier by blues pianist Leroy Carr, whose own massive influence was combining two divergent genre components into one, creating the urban blues prototype that brought the decidedly downhome backwoods image into a more upscale setting. Like much of his repertoire begun with “How Long, How Long Blues” in 1928, on Carr’s original version of “In The Evening…” the backing is pure blues with his piano and Scrapper Blackwell’s acoustic guitar setting a somber tone, yet his vocals were that of a budding pop crooner. It was a novel approach for sure, but its outlook remained that of the blues. Gayten however upends this. His vocal sheds the reflective sound Carr embodied and as a result it’s much more melodic with far more bounce to it which has the effect of altering the overall message from mournful to hopeful, though even so he varies the tempo depending on the sentiments behind each line, getting more downcast at times and at others allowing his optimism to raise his voice to one approaching guarded exuberance. Throughout the performance he lets loose with ad-libbed interjections and frequently repeats his lines for effect which gives it all a loose quality that has you thinking – with its sparse accompaniment – that it may even be a demo or an early run through. Though not nearly as renown for his singing voice as his other skills, Gayten was always an effective vocalist with a tone not dissimilar to fellow New Orleans artist/producer Dave Bartholomew, but if anything Gayten had less of a harsh edge to it and was a bit more soulful and here his vocals are the unquestioned highlight of the record. Not great when viewed for strictly their technical qualities, but in terms of conveying the story in the manner he sees fit it works very well. Then we come to the music he puts behind it and how this too takes the song into a different realm. The structure is almost identical on the surface as both versions start with a piano played by the artist himself, then in the break a guitar takes over to add a different dimension to it. But that’s where the similarities end due to how they’re played. Carr’s playing is skeletal, he’s mainly using his left hand at a very deliberate pace which carries the tune while supplying the bottom for him to work off. He adds a few right hand flourishes, but mostly defers to the guitar for the fills even before the break. By contrast Gayten – as appropriate for rock – has already identified the need to spice things up musically. He’s ramping up the right hand fills for most of it and has altered the tempo with his left – as well as de-emphasizing that component – so as to keep it moving. Jack Scott’s guitar takes over in the first break playing a solo with a hollow-tone that is quite affecting even if he’s not quite urgent enough to convince you of his full commitment. It has more of a jazz feel than is suited for the rest of the song, though when he tosses in some stinging accent notes it adds a little more tension before deferring back to Gayten whose voice immediately carries it back to more solid ground. Though hardly complex, every part works off one another, each one adding different shadings to the feel and in the process giving the entire production more depth. It’s a deceptively modern arrangement for a new day in music. The blues always get far too much credit in rock’s origins, a distant relative rather than a legitimate offspring as most have claimed. One reason for its lack of direct influence is the mere fact that the blues themselves were on the upswing commercially when rock came along and thus there wasn’t an exodus from that genre to a younger style that had yet to make much headway in the market. Established blues artists didn’t have any need to supplement their income by moving to rock, nor was it considered a step up commercially. Younger artists drawn towards blues were certainly not about to embrace its budding rival. But to say there was no connection between the two would be intentionally misleading as well. The song structure of twelve bar blues was a bedrock of modern music, easily adapatable to any form and effective for conveying lyrics of a personal nature that required the direct approach the blues had been built upon. Their separation however was more easily seen in songs like this one whose source was a blues original and where the manner in which they diverged was obvious. Paul Gayten wasn’t the first, nor would he be the last, to apprehend In The Evening When The Sun Goes Down for his own purposes. Ella Fitzgerald and Mel Tormé did it in a jazz setting. Ray Charles typically drew from multiple genres for his take on it, while leaning towards jazz instrumentally he injects vocal touches that contradict that mood and gets more soulful as it goes on. At one time Pete Seeger added a folk tinge to it. In other words it’s a highly versatile composition. But in the hands of blues artists it remained just that – an unambiguous blues song with all of the underlying connotations that suggested. Big Bill Broonzy had a strong version of it in which the heartache sounds like its weighing him down. Robert Jr. Lockwood, the last of the Delta Blues practitioners, does a haunting acoustic version that likewise has the veil of inevitable doom hovering over it. Even Charles Brown, who made his career in the far more uptown cocktail blues style only remotely connected to the deep blues, sounds as if he’s going to break down and cry on his take on the song. If there were any doubt as to the different mindsets behind the genres it should be apparent with recent blues guitar god Gary Clark Jr., who if anyone might be inclined to give it a dash of rock attitude it’d be him, having come of age in an era when rock, not blues touched virtually everything in some way, but he too keeps it firmly in the realm of sparse despair in his studio rendition. But not Gayten. Not at all. Unlike any of them he injects the song with hope and resiliency that is unique to rock. It’s not only the fact he ups the tempo slightly, or embellishes the melody in subtle ways, but it’s his overall outlook in every word he sings that shifts the entire meaning. In the blues the singer is forlorn, knowing all along that their fate is to be alone. They accept this and in a strange way its predictability comforts them, because sadness and misery is all they’ve come to know in this world and so their songs embody this mindset. His voice is buoyant, light and airy. It’s not weighed down by sorrow, it’s uplifted by the freedom he now has and it rises with expectation as it trails off. During it all there’s a glint in his eye, a faint smile on his face, as he’s taking control of the circumstances of their parting and turning it around completely so that the girl who’s leaving the narrator in the other versions is now the one being left behind by him and who, as sure as you’re reading this, will be the one now looking forward to his return with hope and optimism of her own some day down the road. Leave a reply on "Paul Gayten: “In The Evening When The Sun Goes Down”"